arl Reinecke’s violin concerto in G minor, op. 141 is the Sleeping Beauty among nineteenth-century violin concerti. Written for Joseph Joachim, who performed it only once, in a Leipzig Gewandhaus concert under Reinecke’s direction on 21 December 1876, it slept thereafter undisturbed until violinist Ingolf Turban recorded it with the Berner Symphonie-Orchester in September of 2004. Reinecke’s concerto is a work of considerable inherent quality that never entered the repertory, and therefore had no impact on the future history of the genre. It nevertheless occupies a noteworthy niche in the evolutionary history of the Romantic violin concerto. 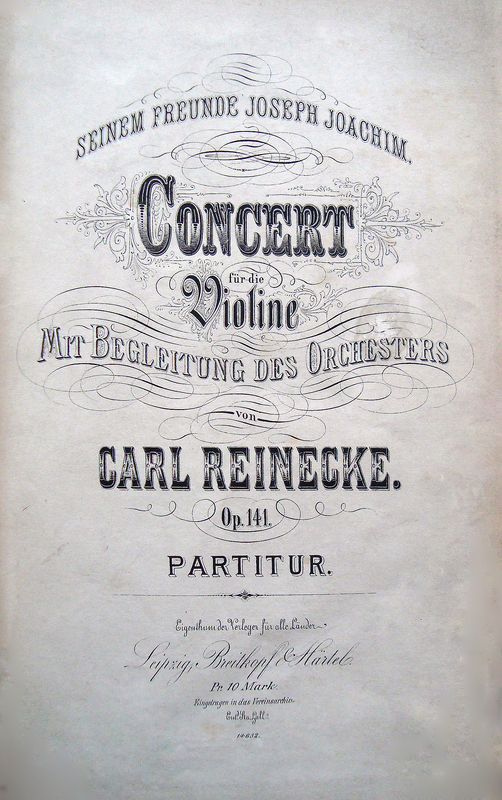 Reinecke composed two violin concerti. The first was conceived in Barmen in the year 1857, and was premiered under Reinecke’s baton by Franz Seiss. It was repeated in altered form by Ferdinand David in Leipzig, on 3 October 1858, and thereafter put aside. It was never published. Reinecke himself described the work as his “totgeborenes Kind” (“stillborn child”). He had originally wanted Joachim to give its Leipzig performance, but Joachim, who had also recently received the revisions of Brahms’s D minor piano concerto, found Reinecke’s work uninspired by comparison. On 3 January 1858 he wrote to Clara Schumann: “Reinecke hat ein Violin-Concert geschickt — so gewöhnlich, so manchmal sogar ungeschickt klingend, wie ich’s von einem so routinirten Componisten nie erwartet hätte.”  Joachim, who never played a work that he did not believe in, refused Reinecke’s invitation. 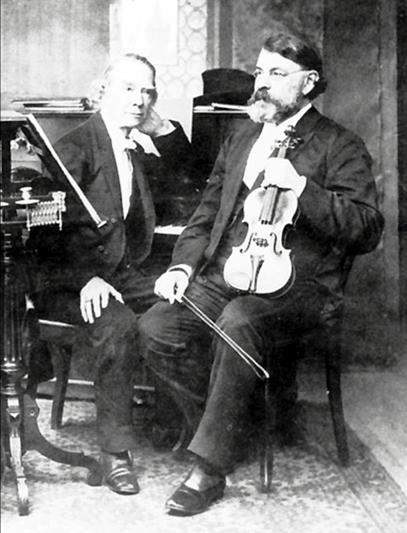 In the immediately ensuing years, Reinecke and Joachim had ample opportunity to form a close musical and personal relationship. Reinecke remained in Leipzig until 1846, returning briefly in 1848. Joachim lived in Leipzig until October 1850, after which he settled in Weimar as concertmaster under Franz Liszt. 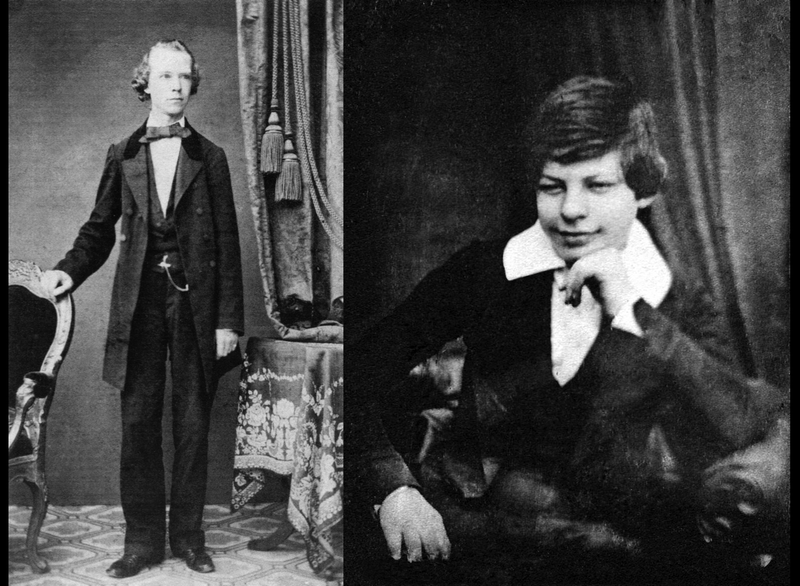 During their Leipzig years, the two young musicians performed together frequently, in both private and public settings, often in partnership with Gewandhaus colleagues Ferdinand David, Moritz Klengel, Niels Gade, Andreas Grabau, and Franz Carl Wittmann. Nur das Bedeutungslose fährt dahin. This Classical, anti-virtuosic, orientation placed Reinecke and Joachim on one side of a significant aesthetic divide. It is customary today to separate violin concerti into two categories: virtuoso concerti and “symphonic” concerti. Nineteenth-century virtuoso concerti include, for example, the works of Paganini, Ernst, Lipinski, Maurer, Wieniawski, Vieuxtemps, et alia, in which the technical and soloistic element predominates and is set in high relief against the tutti. To the other category belong concerti of Spohr, Mendelssohn, Bruch, Brahms, Dvorák and Chaikovsky: works in which the symphonic element plays a pervasive role, and in which the solo violin holds more-or-less constant dialogue with the tutti. Virtuoso concerti have much in common with operatic virtuosity and the art of embellishment. The symphonic style originates in the Classical works of Haydn, Mozart and Beethoven, and, as the term implies, shares a common history and aesthetic with the symphony itself. Dahlhaus’s formulation was the subject of considerable discussion at the 1989 Internationales Musikwissenschaftliches Colloquium in Bonn, “Probleme der Symphonischen Tradition im 19. Jahrhundert.”  The history of the symphonic violin concerto may perhaps shed light on this discussion: first, because the composers who wrote them were by and large the same as those who cultivated the symphony, and second, because the symphonic violin concerto, while a related form of “serious” orchestral music, offered those composers a congenial alternative to the symphony — an alternative that allowed more lattitude for innovation in form and expression than the symphony, which by mid-century had become moribund, through its pretentions, its formal and aesthetic limitations, and the intimidating influence of Beethoven. The violin concerto therefore allowed the creation of at least a few symphonic “Werke von Rang” during the fallow decades of the symphony that Dahlhaus references. It is precisely this freedom — this ability to break free of the shadow of Beethoven and “großer Form” while resting on the authority of accepted models — that appealed to composers of a conservative bent and allowed the symphonic violin concerto, as a form of absolute music, to maintain a provisional hold on the public at a time when the symphony itself was in eclipse. As Joachim mentioned in his letter, Spohr provided an early example of unconventional form — a concerto in the form of an operatic scena. Mendelssohn’s concerto (1845), which influenced subsequent composers as late as Sibelius, is replete with formal innovations (the lack of opening tutti, the centrally-placed cadenza in the first movement, the unusual recapitulation in the first movement, etc.). Equally important, later composers also felt freer in the violin concerto to explore certain more lyrical or characteristic moods — moods that were congenial to the era, but that lay outside the aesthetic norms of the symphony, or were problematic if subjected to the formal processes expected in the symphony post-Beethoven. Thus, while characteristic symphonic works such as Goldmark’s Ländliche Hochzeit Symphony (1876) once enjoyed a protracted period of popularity, they are no longer frequently performed. Similarly conceived concerti such as Lalo’s Symphonie Espagnole or Bruch’s Schottische Fantasie, on the other hand, continue to be staples of the violinist’s repertoire. The foregoing table demonstrates the dominance that Joachim had over the whole genre of symphonic violin concerti in the 19th century, approached only, from the 1870s onward, by Pablo de Sarasate. Even Beethoven’s concerto would have sunk into obscurity, had not the young Joachim revived and championed it. Joachim learned Mendelssohn’s concerto from its composer — he was the second violinist to play it, contemporaneous with David. He also played Harold in Italy under the composer’s baton, whereas Paganini, who commissioned the work from Berlioz, never played it, claiming the viola part was lacking in virtuosity, and insufficiently prominent. The works of Schumann and Spohr likewise belonged to Joachim’s repertoire. It is telling that Joachim never played the concerti of Ernst, Wieniawski or Vieuxtemps, although he was friendly with their creators, and valued them highly both as violinists and as men. Though he was a great virtuoso, Joachim eschewed violinistic fireworks. More than any other 19th century violinist, he was responsible for promoting the violin concerto as a “serious” form — in the sense of the Leipziger res severa — that, in its expressive possibilities, could stand comparison with the symphony. Reinecke’s concerto reflects his sympathy with Joachim’s project: he worked within the traditions of the symphonic concerto, anticipating and advancing the revival of the genre. Viewing this table, one might argue that Reinecke’s concerto, far from being “reactionary,” was a harbinger, not only of a zweites Zeitalter of symphonic violin concerti, but of a goldenes Zeitalter. The subsequent four years alone saw the appearance of the canonical concerti of Goldmark, Brahms, Tchaikovsky, Dvořák, Bruch (Schottische Fantasie), and Saint-Saëns. The third movement of the work will serve briefly as an example of Reinecke’s poetic, anti-virtuosic conception, expressed with the innovative freedom of form that is characteristic of the 19th-century symphonic violin concerto, generally. The entire concerto is strongly reminiscent in tonality, mood, and theme of Bruch’s popular Concerto no. 1 in G minor, and, like the Bruch, it seems to glory in its elegiac slow movement as its real reason for being. A short transition, such as one finds in Beethoven or Mendelsson, introduces the movement. The main theme, a broad amabile, demonstrates the double stop technique for which Joachim was famous in his time. It is difficult to play, but not virtuosic in character. The recursive nature of the theme creates a somewhat too-static impression at the start of a movement that is conceived in a similarly recursive form. The “A” theme alternates with a contrasting, arpeggiated, “B” theme, the character of which is strongly reminiscent of Schumann. The “C” group can be heard as a variation or development of the “A” theme — further contributing to the recursive nature of the movement. An interesting feature of the movement is the presence of two dramatic, symmetrically placed D major scales that function as audible orientation points within the overall structure. Symmetric, as well, are two short, rather brilliant developments: one in double stops, and the other in triplets. The most interesting feature of the movement, however, is the threefold return of the main theme from the second movement — each time varied and ornamented — first in E, then in F, and finally in the tonic G major. 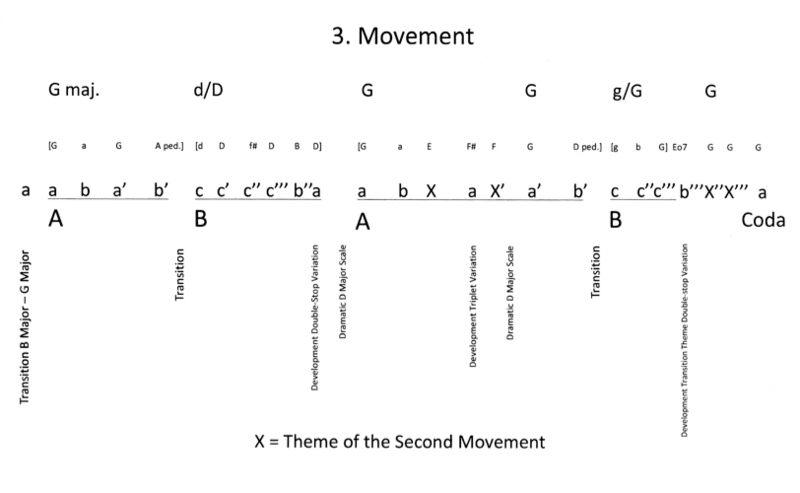 These tonally progressive “reminiscences,” which function as interruptions (or “deformations”) of the Rondo, emphasize the familial relationship between the last movement “A” and “C” themes, and the main theme “X” of the lyrical slow movement. Thus, the entire third movement can be understood as a continuation, or development, of the second movement. The deformation of the standard sonata-rondo form through lyrical reminiscences serves an expressive purpose that carries the piece far from mechanical, “empty,” virtuosity into the world of Schumannesque poetry. According to Joseph von Wasielewski, Reinecke’s Violin Concerto deserves, “in musikalisch künstlerischer Hinsicht unstreitig ein hervorragender Platz in der Geigenliteratur, wenn auch die Principalstimme nicht mit bestechender Brillanz ausgestattet ist. Reinecke hat es sich offenbar angelegen sein lassen, mehr die solide Seite als die virtuosenmäßige Bravour des Geigenspieles hervorzukehren.” Wasielewski hints at the work’s fatal weakness — as well as, potentially, its most ingratiating attribute — when he continues: “Wer das Werk von diesem Gesichtspunkt aus betrachtet wird seine Freude daran haben.”  In any case, Reinecke’s violin concerto is an attractive work that despite, or perhaps even because of, its previous neglect would provide a welcome alternative in the violinist’s repertoire to Bruch’s all-too-frequently performed masterpiece. It also provides a valuable insight into the musical friendship between two important 19th-century performer/composers and their relationship to aesthetic trends in European symphonic music at a critical point in its development. Recorded at the Grosser Saal, Kultur-Casino Bern, Johannes Moesus, conductor, 09/23/2004 and 09/24/2004; released 04/24/2007 on the CPO label, no. 777 105-2, ISBN 761203710522. Reinecke: “David hatte das Werk übrigens eigenmächtig in solcher Weise zugestutzt, daß ich förmlich erschrak, als ich die Partitur später zurückerhielt. Es war eine Schwäche von David, daß er alles für seine, vielleicht etwas eigenseitige Technik umarbeitete und sich auch anderweitige Eingriffe in die Komposition anderer erlaubte.” Carl Reinecke, Erlebnisse und Bekenntnisse, Doris Mundus (ed. ), Leipzig 2005, p. 102. Johannes Joachim and Andreas Moser (eds. ), Briefe von und an Joseph Joachim (2/3), Berlin 1912, pp. 1-2. Signale für die musikalische Welt, vol. 35, no. 3 (January 1877) p. 35. 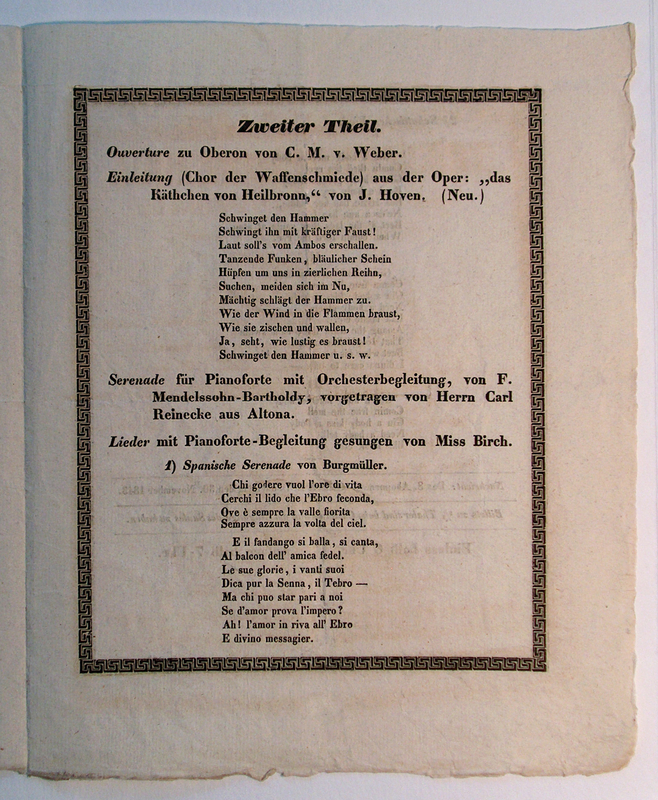 Musikalisches Wochenblatt, vol. 8, no. 2 (5 January 1877), p. 21. Kiel, 24 June 1878. Vide: Signale für die musikalische Welt, vol. 36, no. 43 (September 1878), p. 681. — Reinecke, Erlebnisse und Bekenntnisse, p. 260. — Reinecke, op. cit., p. 261. Public Opinion, vol. 20, no. 16 (16 April 1896), p. 500. Emil Michelmann, Agathe von Siebold: Johannes Brahms’ Jugendliebe, Göttingen 1929, p. 318. Eduard Hanslick. Sämtliche Schriften. Historisch-kritische Ausgabe, Dietmar Strauß (ed. ), Band I, 4: Aufsätze und Rezensionen 1857-1858, Wien 2002, pp. 359-360. I use this term in a somewhat freer manner than is customary. Carl Dahlhaus, Die Musik des 19. Jahrhunderts, in: Neues Handbuch der Musikwissenschaft, C. Dahlhaus (ed. ), vol. 6, Wiesbaden 1980, p. 220. Vide Kongreßbericht: Probleme der Symphonischen Tradition im 19. Jahrhundert, Siegfried Kross (ed. ), Tutzing 1990. — Joachim and Moser (eds. ), Briefe von und an Joseph Joachim (2/3), p. 393. Wilhelm Joseph von Wasielewski, Carl Reinecke. Sein Leben, Wirken und Schaffen, Leipzig n.d., p.85.